The Pasta Boat lets you cook, strain and serve perfect pasta using just your microwave. It is a microwaveable pot that makes making pasta dishes fast and easy. You no longer have to worry about boiling water or using multiple pots anymore. The Pasta Boat can cook, drain, serve and store meals, all in one pot. 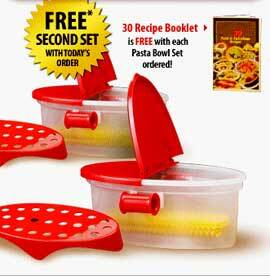 Use it to make all kinds of pasta, whether it is Penne, Rigatoni, Macaroni, or Shells. It is also works great for stuffed pasta or lasagna. The handles lets you measure out the perfect portion of pasta every time. The Pasta Boat is designed to redistributes heat evenly in order to fast, easy and perfect cooking. Once the pasta is done, the included strainer lid makes straining a breeze. Plus the Pasta Boat stores leftovers in the same container, all you have to do is just put it in the fridge. I have seen the TV infomercial and doubted the claims, but surprisingly enough - it cooks pasta as good as it claims! And, no mess with the big pot and steaming up the kitchen - total cook time is half as compared to on the stove. I also cooked baked potatoes in it as on the infomercial and the results were as they said - delicious! I highly recommend this product!